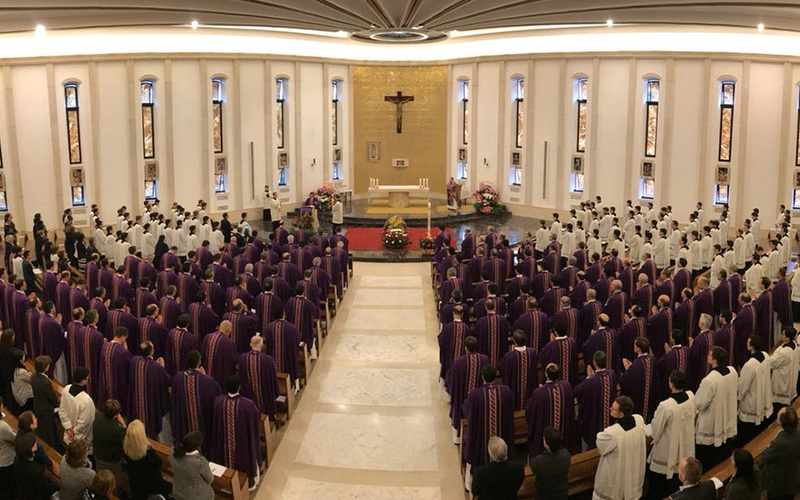 A Mass for the eternal repose of Brother Anthony was held in Rome, with Legionary seminarians and friends in attendance. Brother Anthony’s body will be transported to Houston, Texas, where his parents reside, for the funeral and burial. Today, on April 10, 2018, a Mass for Brother Anthony Freeman, LC, was celebrated at 6:30 p.m. in the chapel of the Legionaries of Christ International College, presided over by Father Eduardo Robles-Gil, LC, general director of Regnum Christi. Brother Anthony died of dilated cardiomyopathy on the night between April 1 and 2 in Rome. He would have been ordained a deacon this summer. Legionaries of Christ, both seminarians and priests, as well as Consecrated Women and Lay Consecrated Men of Regnum Christ and other members of Regnum Christi were present to pray for the eternal repose of the soul of Brother Anthony. Sometime in the next few days the body of Brother Anthony will be transferred to Houston, Texas, where his parents live, for the funeral and burial. For more information about the death of Brother Anthony Freeman, LC, you can consult the communiqué issued on April 6 by the Congregation of the Legionaries of Christ. A gallery of photographs of the Mass can be found at this link.